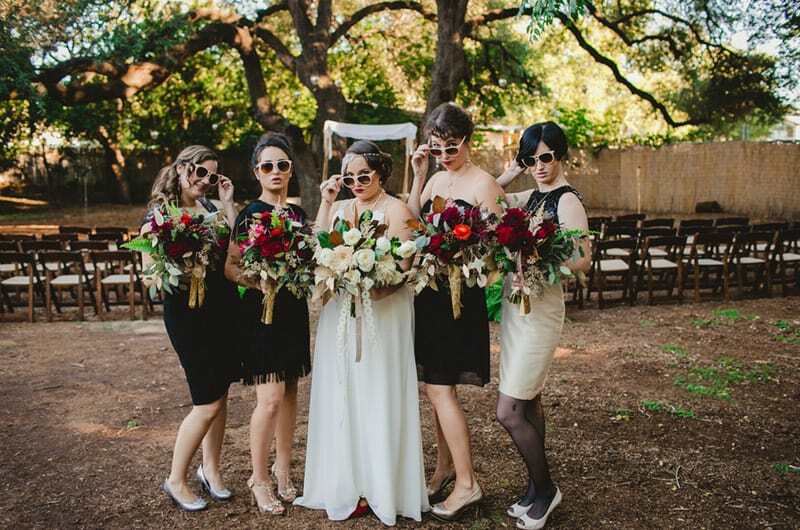 When Carrie from Sur La Lune photography described this wedding as visually being like boho meets 1920’s glam, I instantly knew I was going to be sold. As soon as I saw the images of Sara in her unique beaded headpiece… the flourishing florals, the marching musicians and the gorgeous outdoor venue, I knew we had hit the jackpot. Every inch of this wedding is incredible, the bridesmaids look fierce in their mismatched black dresses, Michael is sporting a seriously dapper outfit complete with polka dot handkerchief, which wins huge points with me and Sara looks like a 1920’s hollywood sweetheart. Be prepared to swoon! “Mike and I felt that our wedding really was a reflection of us and our community. It wouldn’t of been possible without our network of friends. Everyone from the musicians to the baker to the photographer was a friend, and luckily for us also some of the best in the business! I am an artist/designer and Michael is a musician. So we took on the planning of our wedding like a large installation piece. It wasn’t about wanting a specific look or exact color it was about creating a feel. We decided that the theme for our wedding would be fun. Once we knew we wanted our wedding to be a large party, I took off from there with ideas. We got engaged in December and I was really inspired by all the sparkle from the holidays. I knew I wanted to combine the glam of a special moment with the richness of nature and raw elements because in the end we are a pretty casual couple. I had a hand in designing every element of the wedding look from my headpiece handmade by the wonderful Jane-Michael Stallings, to the flowers. There were a lot of decisions, but in the end we couldn’t of been happier. Everyone says it is going to feel like the best day of your life, and to be honest I didn’t know if I truly believed that till that day. Both Michael and I were blown away by how our friends and family made the day come alive for us. A special shout out to my Dad who designed the stick ring holder and invented a special pulley system with fishing line to hang all of the lanterns for us the morning of the wedding, to my friend Meghan who was my day of planner so I could take much needed personal time, to my Mom for spending countless days updating google spreadsheets and timelines with me, and to my sister/maid of honor who kept her cool on our wedding day and saved me from myself when I stepped in a mud puddle an hour before the ceremony with a very recommended day of bridal emergency kit. How is that for some good advice! What would be your three things you would want to focus on for your wedding? And have you thought about carrying a bridal emergency kit?